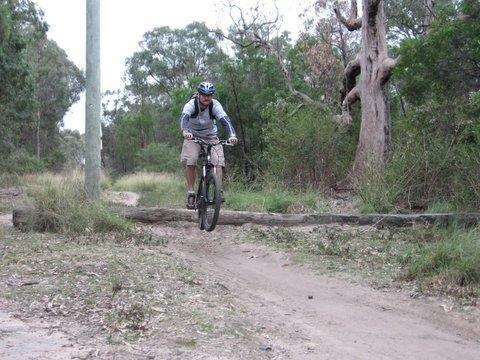 This trail is maintained by Western Sydney Mountain Bike Club and is used as their home XC track. So when there is no race meeting on, anyone can ride. Having said that, when you do ride it, look after the track by not skidding excessively or making changes to the track. It is 95% singletrack that has nice fast flowing bermed bends, some technical drops and climbs, but nothing too difficult. Bridged creek crossings and dark forest areas making sure the scenery and terain never get boring. Deffinately one to make sure you can say you have ridden. Review: A great ride with some challenging sections. It will always challenge you and also reward you. Also the home of an awesome an active club with lots of events held there. Review: Its a good track but can get a bit boreing after a while, there is a section of track i can never get up but after that really flowy, it gets harder the faster you ride it. It is a good intro- track for mountain biking, if u r going there check out wsmtb website and turn up on a club race day. Yellowmundi MTB Trail 4.00 out of 5 based on 3 ratings. 3 user reviews.